The Wake Forest University Creative Writing program’s Dillon Johnston Writer Reading Series presents an evening with poet Carmen Giménez Smith on Thursday, October 18, at 6:00 p.m. in the Charlotte and Philip Hanes Art Gallery in Scales Fine Arts Center. The reading will be followed by a reception and a book signing. This event is open to the campus community and the public. Born in New York, poet Carmen Giménez Smith is the daughter of South American immigrants. A CantoMundo fellow, she earned a BA in English from San Jose State University and an MFA in creative writing from the University of Iowa’s Writer Workshop. She writes lyric essays as well as poetry, and is the author of the poetry chapbook Casanova Variations (2009), the full-length collection Odalisque in Pieces (2009), the memoir Bring Down the Little Birds: On Mothering, Art, Work, and Everything Else (2010). Her 2013 collection Milk and Filth was a finalist for the National Book Critics Circle Award. Her latest collection of poems, Cruel Futures, is a volume in the 2018 City Lights Spotlight Series book. Be Recorder will be published by Graywolf Press in Fall 2019. Giménez Smith’s work explores issues affecting the lives of females, including Latina identity, and frequently references myth and memory. Wolf Schneider, writing in New Mexico Magazine, described Giménez Smith’s poetry as “waves of free verse, incantation and song.” With the publication of Odalisque in Pieces, Giménez Smith was featured as a New American Poet on the Poetry Society of America’s website. She co-edited Angels of the Americlypse: New Latin@ Writing, an anthology of contemporary Latinx writing (Counterpath Press, 2014), and she is the current editor of The Nation‘s poetry section, alongside Stephanie Burt. Carmen serves as the publisher of Noemi Press, which has published over 40 full-length collections of poetry and fiction. Giménez Smith is the co-director for CantoMundo. 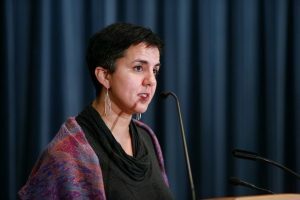 She is a Professor of English at Virginia Polytechnic Institute and State University in Blacksburg, VA, where she lives with her husband, writer Evan Lavender Smith, and their two children. The Dillon Johnston Writers Reading Series, named after the founder of Wake Forest University Press, brings to campus established and emerging fiction writers, poets, and writers of creative nonfiction each year to give literary readings and visit creative-writing workshops in the Creative Writing Minor and other courses at Wake Forest. The literary readings are followed by a book signing and reception.